Charles Henry Hart [1847-1918], New York; his widow Mrs. Charles Henry Hart; sold 29 May 1920 to Thomas B. Clarke [1848-1931], New York; his estate; sold as part of the Clarke collection on 29 January 1936, through (M. Knoedler & Co., New York), to The A.W. Mellon Educational and Charitable Trust, Pittsburgh; gift 1947 to NGA. The name of the seller and the date of purchase are recorded in a copy of Portraits by Early American Artists of the Seventeenth, Eighteenth and Nineteenth Centuries Collected by Thomas B. Clarke, Exh. cat., Philadelphia Museum of Art, 1928, annotated with information from files of M. Knoedler & Co., NY (copy in NGA curatorial records and in NGA library). Mrs. Hart provided the information that her husband had owned the painting. Hart, a lawyer, was a writer, dealer, and collector of American art; Dictionary American Biography, New York, 1944-1988, 4:355-356. Exhibition of Portraits By Early American Portrait Painters, The Union League Club, New York, 1923, no. 6, as Isaac Motte. Portraits by Early American Artists of the Seventeenth, Eighteenth and Nineteenth Centuries, Collected by Thomas B. Clarke, Philadelphia Museum of Art, 1928-1931, unnumbered and unpaginated catalogue, as Isaac Motte. [Opening exhibition], Mint Museum of Art, Charlotte, North Carolina, 1952, no. cat. Opening Exhibition of The George Thomas Hunter Gallery of Art, Chattanooga Art Association, Tennessee, 1952, unnumbered. Carolina Charter Tercentenary Exhibition, North Carolina Museum of Art, Raleigh, 1963, no. 34. National Gallery Loan Exhibition, Mint Museum of Art, Charlotte, North Carolina, 1967, no. 3. Loan for display with permanent collection, Georgia Museum of Art, University of Georgia, Athens, 1972-1974. Extended loan for use by the Ambassador, U.S. Embassy residence, Dublin, Ireland, 1978-1981. Exhibition of Portraits By Early American Portrait Painters, Exh. cat. The Union League Club, New York, 1923: no. 6. Portraits by Early American Artists of the Seventeenth, Eighteenth and Nineteenth Centuries, Collected by Thomas B. Clarke. Exh. cat. Philadelphia Museum of Art, 1928, unnumbered, as Isaac Motte. Middleton, Margaret Simons. "Jeremiah Theus of Charles Town." Antiques 60, no. 2 (August 1951): repro. 104. Opening Exhibition of the George Thomas Hunter Gallery of Art, Exh. cat. Chattanooga Art Association, 1952: unnumbered. Middleton, Margaret Simons. 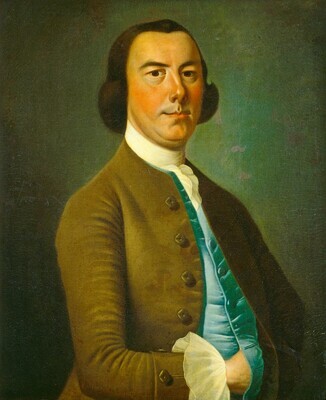 Jeremiah Theus, Colonial Artist of Charles Town. Columbia, South Carolina, 1953: 151-152. Carolina Charter Tercentenary Exhibition. Exh. cat. North Carolina Museum of Art, Raleigh, 1963: no. 34. National Gallery Loan Exhibition. Exh. cat. Mint Museum of Art, Charlotte, North Carolina, 1967. In special issue of Mint Museum of Art Quarterly (Fall 1967): no. 3, repro. American Paintings and Sculpture: An Illustrated Catalogue. National Gallery of Art, Washington, 1970: 116, repro. American Paintings: An Illustrated Catalogue. National Gallery of Art, Washington, 1980: 248, repro. American Paintings: An Illustrated Catalogue. National Gallery of Art, Washington, 1992: 367, repro. Miles, Ellen G. American Paintings of the Eighteenth Century. The Collections of the National Gallery of Art Systematic Catalogue. Washington, D.C., 1995: 292-294, color repro. 293.